To meet the demands of the modern-day processing industry, processing engineers are seeking ways to reduce downtime and labor costs, whilst maintaining the highest standards of safety and product quality. 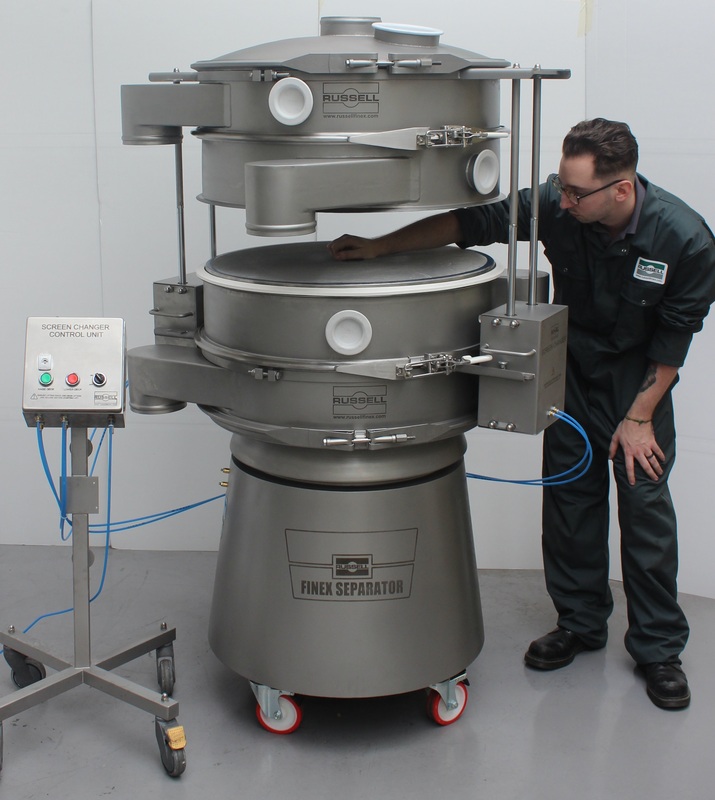 To identify ways in which the usability of its popular range of grading sieves could be improved, Russell Finex consulted a group of customers and the solution was the award-winning Russell Screen Changer™. A new, advanced version of an existing Russell Finex product, this new screen changing device for grading separators utilizes two high performance pneumatic piston assemblies, lifting sieve decks to a safe height allowing comfortable access to the screen. 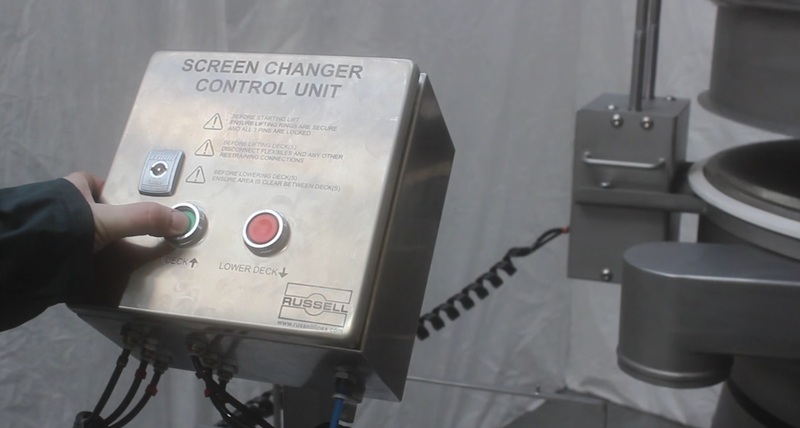 The unit is supplied with an easy-to-use control device, to raise, lower and lock the screen changer into place during maintenance. An innovative interlocking safety system uses the latest pneumatic technology to provide a fail-safe design. By cutting the air supply and creating a lock effect, the cylinders are locked perfectly in situ. Even if the supply of air or power to the machine is lost, absolutely no movement is possible. The technology allows this to be done during both lifting and lowering operations, automatically locking safely into place whenever the operator releases the control button, ensuring the highest level of safety. The new screen deck lifter uses an innovative clamp ring fitting, which allows the system to be easily fitted to any large separator machine, and is compatible with other manufacturers’ models. Also, where a factory has multiple sieves, it can be used on more than one vibratory separator and can be transferred from one to another quickly and easily. Another new feature allows the operator to change multiple screens without having to remove or reposition the screen changer unit. This is a first for a screen changing device and further ensures maintenance time is kept to an absolute minimum. Highlighting these enhancements, the new Russell Screen Changer™ has been recognized with two prestigious industry awards – the SHAPA (Solids Handling and Processing Association) Innovation Award and the PPMA (Processing and Packaging Machinery Association) Most Innovative Ancillary Equipment Award. Drawing on over 80 years of experience identifying and solving processing problems, Russell Finex invests in extensive research, in order to quickly adapt to new demands and technologies. As a global leader in high-quality industrial separation equipment, the company utilizes relationships with major global manufacturers such as Nestlé, Akzo Nobel, Pfizer and many others to ensure the highest standards of safety, usability and performance are upheld. Contact Russell Finex to discover how a range of upgrades could benefit your production process.